Summary Two-bay quad core Intel Core J1900 Celeron NAS with lots of ports and wide range of downloadable apps. 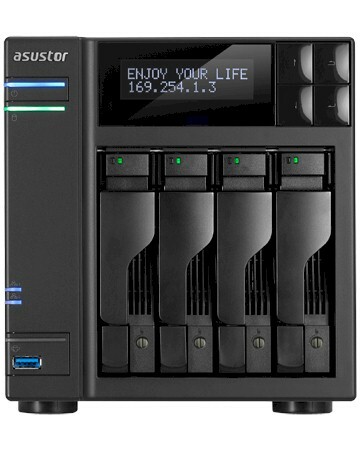 Summary Four-bay quad core Intel J1900 Core Celeron NAS with lots of ports and wide range of downloadable apps. Processor - The AS51XXT all use an Intel J1900 2.0 GHz quad-core Celeron processor (burst up to 2.41 GHz); The AS50XXT series uses an Intel J1800 2.4 GHz dual-core Celeron processor (burst up to 2.58 GHz). Memory - The AS510XT ships with 2 GB of DDR3 RAM. The AS500XT ship with 1 GB. Product in both families of NASes are upgradeable to 8 GB total RAM. LCD Panels - None of the AS50XXT models have LCD status panels. The four, eight and 10 bay AS51XXT's do. Disk Trays - The disk trays on the AS51XXT NASes have locks. The disk trays on the AS50XXT NASes don't. All of the other features of the AS51XXT family of NASes are identical to those of the AS50XXT family. Since the only other differences are in performance, we'll jump directly to the performance section of the review. ADM 2.3.1.R1K7 firmware was loaded onto the AS5104T review sample and performance tests were run using the Revision 5 NAS test process. Since the AS5102T uses the same processor, RAM and Ethernet components, all testing was done on the AS5104T. 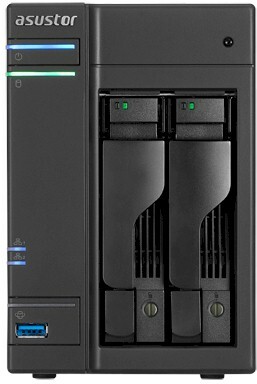 The AS5104T tests used four drives configured in single RAID 0, 5 and 10 volumes. The AS5102T tests used two drives in single RAID 0 and 1 volumes. All tests were run using Western Digital Red 3 TB (WD30EFRX) drives provided by WD. Normally, the first chart I look at when evaluating NAS performance is the default NAS chart that looks at File Copy Write Performance. I filter for the number of drives and the latest test method (black bars) and see where the NAS being currently reviewed appears. The composite image below shows how the AS5102T (left) and the AS 5104T (right) compare to other products matching the filters. The test for both ASUSTOR AS510XT NASes turned in virtually identical scores of ~ 110 MB/s, ranked near the top of the charts and were virtually identical to their AS500XT siblings. File Copy Read performance was similar, at 107.5 MB/s (AS5102T) and 108.1 MB/s (AS5104T) and both ranked near the top of the charts for their filtered products. Both of the AS510XT products were about 1 MB/s faster than their corresponding AS500XT siblings - less than 1% difference. Next, I look at the Benchmark Summary, which shows all test results for each product. In the composite image below, you'll note that for both the AS5102T (left) an the AS5104T (right), the results are remarkably consistent. There was really very little difference in the File Copy Write and File Copy Read numbers for any tested RAID level for either set of tests run. eSATA and USB 3.0 backups tests, as well as iSCSI read/write tests were all in excess of 100 MB/s.